Rockabillykungen, ikonen och den levande legenden Robert Gordon är tillbaka! Torsdagen den 4 april kommer han till Umeå och Droskan! Robert Gordon har i hela sin karriär haft enastående gitarrister som Link Wray, Chris Spedding och Danny Gatton vid sin sida. På den här turnén finns ingen mindre än Darrel Higham med. Han har spelat tillsammans med bland annat Rocky Burnette, Billy Lee Riley, Shakin’ Stevens, Eddie Cochran och Slim Jim Phantom från Stray Cats. The summer of 1977 was dominated by disco grooves, so Robert Gordon’s classic rock & roll single “Red Hot” was in stark contrast with everything else in the charts at the time. This vibrant single was a surprise hit, and it opened the doors for a major rockabilly revival, which brought forth acts like The Stray Cats, The Cramps and Shakin’ Stevens. 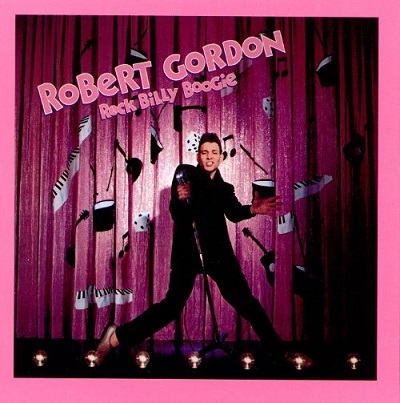 But Robert Gordon was the one that started it all, and with classic records like “The Way I Walk” and “Rockbilly Boogie”, he achieved iconic status. Artists like Bruce Springsteen and Iggy Pop wrote songs for him, and Bruce even did a couple of duets with him. Jerry Lee Lewis, never one to praise other artists, called Gordon “the real deal”. Now, a little over 40 years later, Robert Gordon is back. He lived the rock & roll lifestyle for many years, but he has now wisely slowed down. Robert looks and sounds better than he has in years. He has assembled a first class band for April ’19 tour, which even includes top rock & roll guitarist Darrel Higham, a high profile player who has worked with the likes of Jeff Beck and Imelda May.